The Matlock Mercury featured this story on 20 Feb 2002. "T'OWD MAN" of Bonsall has come back to the village after almost a century and a half. 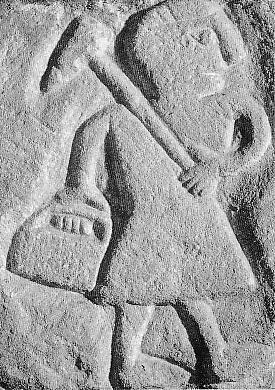 The early medieval carving of a Derbyshire lead miner originally stood for centuries in Bonsall Parish Church but was removed for safe keeping in 1863 during the church's renovation. A few years later it turned up in a Bonsall garden and from there was moved to Wirksworth, where it was built into the south transept of the Parish Church. Bonsall residents have always wanted to get "T'owd Man" back as it is viewed as an important part of their village heritage. Vice Chairman of Bonsall Parish Council, Cllr Martin Cruttenden said: "Lots of people mentioned that Wirksworth had their 'man' - it was a bit of jokey controversy." So the Parish Council decided to have an exact replica made for display in the centre of Bonsall. They commissioned Graham Barfield of Bole Hill, Wirksworth to carve a replica from Birchover sandstone, the nearest available to the original Black Rocks' stone. Graham photographed the original several times and laid a grid over it to ensure that the new piece was a perfect match. He chiselled its surface to create an old effect. It has now been set into the wall of the newly restored "bandstand" overlooking the historic Cross. Bands of yesteryear used to play to the Mayday and Carnival crowds from this area, which has recently been re-flagged, a bench has been added and it is the display site of the award winning village map. Cllr Cruttenden said that locals are "very pleased" to have "T'owd Man" back and at weekends, the newly restored area attracts "non-stop walkers", who consult the map and admire the carving. The plaque beneath the carving however is raising a smile or two. It gives a brief resume of the historical chequered movements of the "T'owd" man followed by "This replica was carved by Graham Barfield of Bolehill in December 2002"!! Cllr Cruttenden explained that the carving was due to be erected in December 2001, but it was postponed to January 2002. He rang the engravers to say that the year had to change from 2001 to 2002, but omitted to mention the change to the month! SET THE DATE: Pictured is Cllr Di Moor, Chairman of the Parish Council and Graham Barfield with the mistaken engraving.